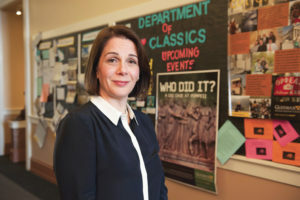 Mary R. McHugh published an essay, “Plato’s Timaeus and Time,” delivered at the first Fonte Aretusa Conference in Siracusa, Sicily in 2015. The essay was published by Parnassos Press in a volume entitled Plato at Syracuse: Essays on Plato in Western Greece with a new translation of the Seventh Letter by Jonah Radding, edited by Heather L. Reid and Mark Ralkowski. Description of the editors: “Mary McHugh draws a fascinating thread that connects Plato’s cosmology as reported in Timaeus with contemporary thinkers in Magna Graecia, on to Archimedes’s astronomical innovations, and even into the mathematical discoveries of the Islamic world. The essay shows how Plato’s trips to Syracuse had a huge impact not only on the development of philosophy, but also on science and technology.” Curious? A pdf of the essay is available on McHugh’s profile page, on the Gustavus Classics department website.